Foliage: Stemless above the ground, grows from bulbs. Forms colonies. Basal leaves only, with each leaf divided into three heart shape lobes folded along the center axis. Leaves are on the end of long slender stems. The leaves are purple on the underside. The leaflets fold and droop at night or on overcast days. Flower: 5 Regular Parts and up to 2cm wide (0.75 inches). They are pink-violet with darker veins and yellowish centers. The flowers close at night and on very cloudy days. Flowering time: Flowers early May to early June. Fruit not usually seen. 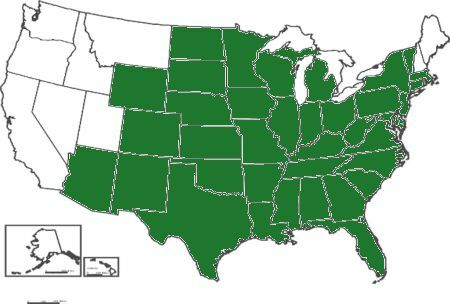 Range in New Jersey: Frequent in moist woods of the northern counties; rare and local southward in the Middle district. Misc. The common name "sorrel" refers to its sour taste, or "sour juice". 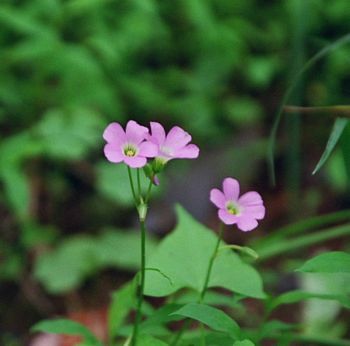 Some Native AmerIndians fed their horses crushed bulbs of violet wood sorrel to enhance their speed. Sorrel leaves are considered edible, but should be eaten in moderation because they contain oxalic acid. 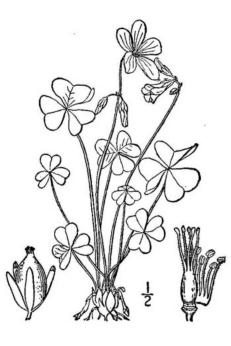 Oxalis, Sour, referring to oxalic acid in leaves & roots; violacea, violet colored.